Barbecued meat is very popular in Georgia both as a family meal and also at feasts and celebrations. Pork is the most popular meat, followed by chicken. 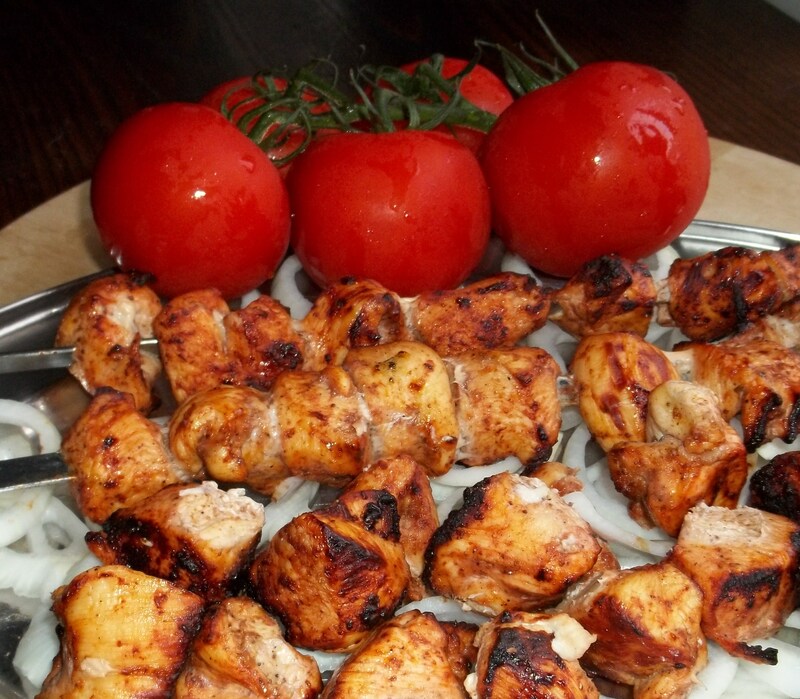 In this recipe we will show you how to prepare barbecued chicken. 1 kilo of chicken breasts, 1 large onion, 1 clove of garlic, 2 tbs of tomato puree, pinch of black pepper, 3 tbs sugar, 3 tbs of coarse salt, half tsp of powdered Berberis berries, half tsp of powdered saffron and 1 liter of water. Make a marinade: Do this at least 12 hours before cooking so that the meat becomes soft and full of flavor. Add the salt and sugar and 1 tbs of tomato puree to a mixing bowl. Add 1 liter of water and stir until the sugar and salt has dissolved. Cut the clove of garlic into four pieces and add to the mixture. Add the bay leaves. Add the chicken breasts, cover the bowl and place in the refrigerator. 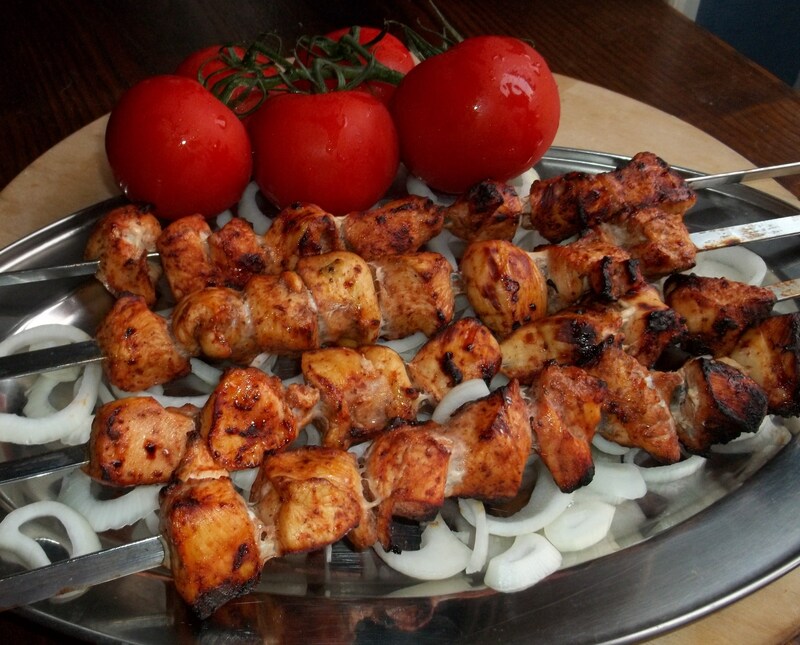 The marinated chicken can be used in many recipes but we chose to barbecue it. 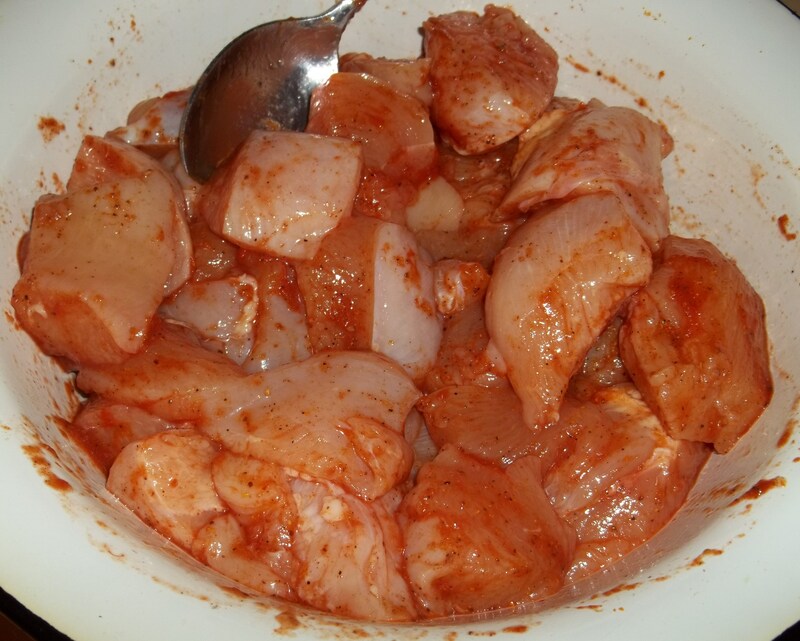 When you are ready to cook, remove the bowl of marinated chicken from the refrigerator and drain the water. 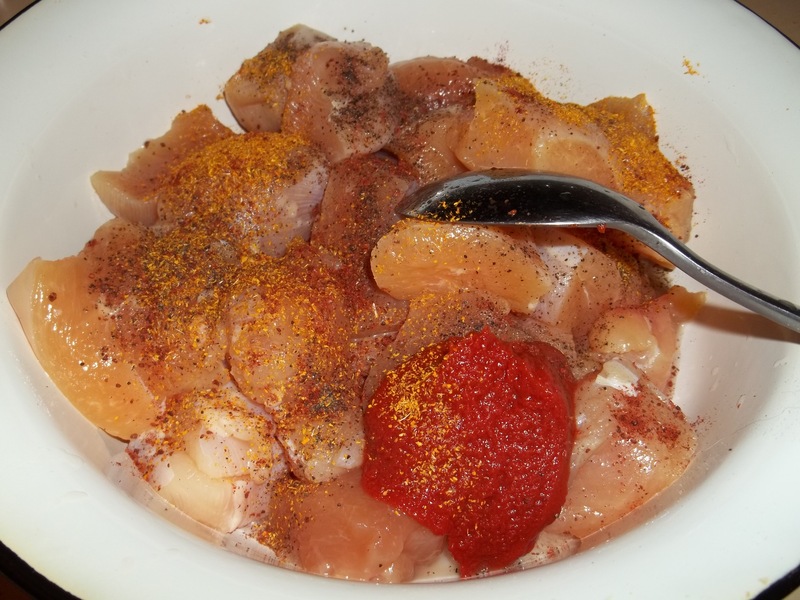 Cut the chicken breasts into medium sized cubes and put them in a mixing bowl. Add 1 tbs of tomato puree, saffron, powdered Berberis berries and black pepper. 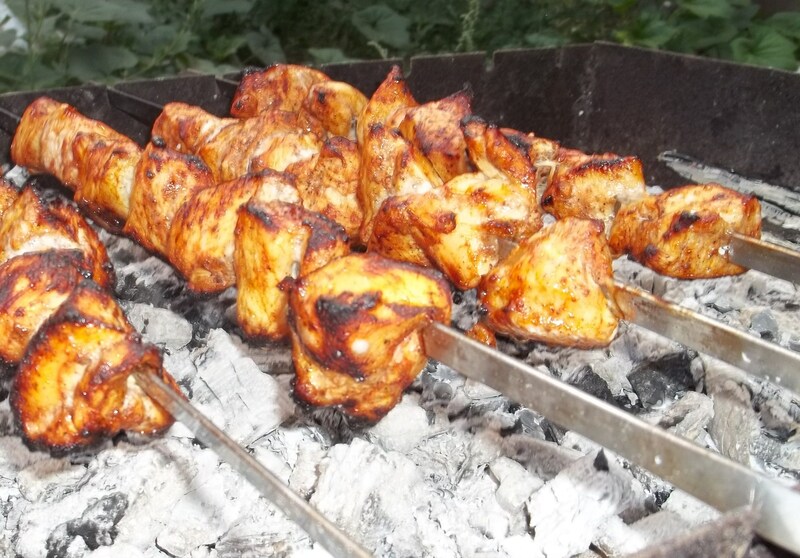 Place skewers on a barbecue. 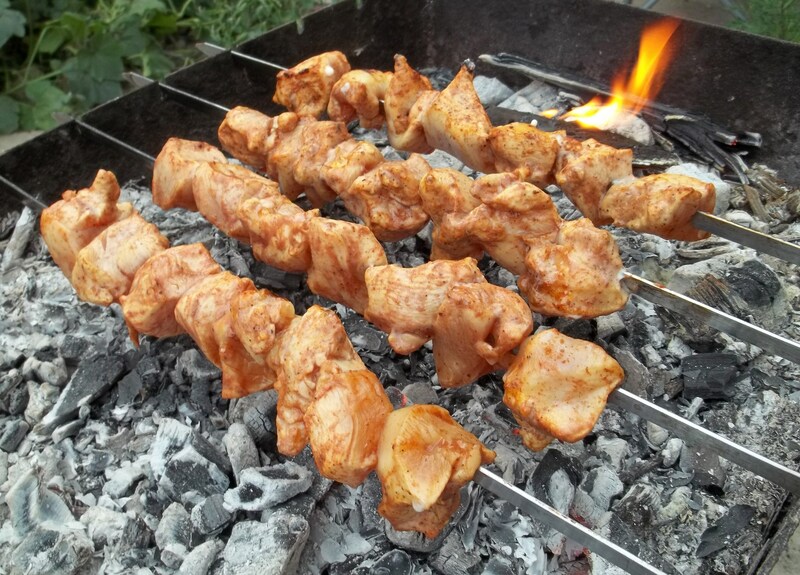 Our type of barbecue is called a makhali in Georgian (Georgian: მაყალი). 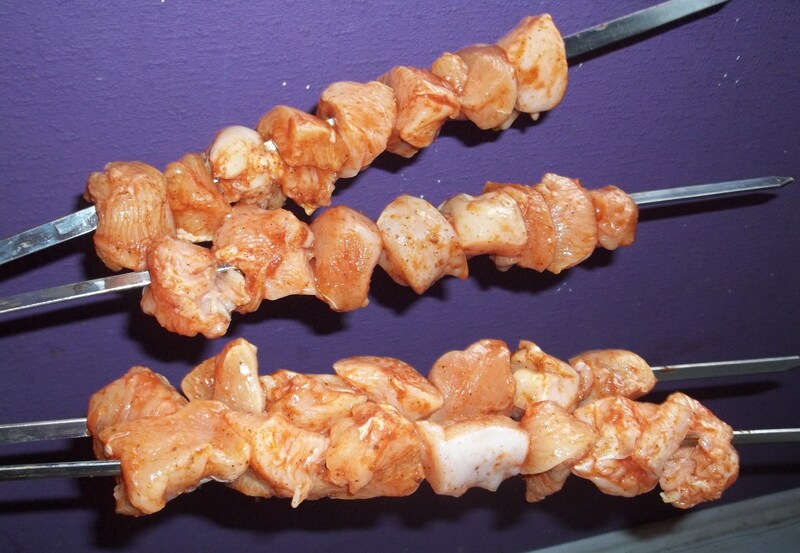 Turn skewers regularly to ensure the meat is thoroughly cooked. We ate our barbecued chicken with tomatoes and sliced onions. Delicious! Thos look delicious… I’ve never heard of berberis berries thought… what is that? The berries are edible and rich in vitamin C, with a very sharp flavour. The thorny shrubs make harvesting them difficult. They are often used in Middle Eastern and European rice pilaf recipes. you cna get powdered berberis berries at any middle eastern grocery store, just ask for ‘sumak’. Hmm. I wonder how this compares to Texas barbecue! I’ve never had a Texas barbecue but I expect it’s great! I have had both. Georgian BBQ is wayyyy better. I am not Texan nor Georgian so I have no dog in the race. Georgian cooking is all finger-licking. Yum! Yes what are Berberis berries? Several species of Berberis are popular garden shrubs, grown for such features as ornamental leaves and for their berries. The berries are edible and rich in vitamin C, with a very sharp flavor. They are often used in Middle Eastern and European rice pilaf recipes. You probably can get them as they are often used in Middle Eastern and European rice pilaf recipes. Now I know what I’m going to do next time there’s a bbq going on. Hello I was googling for chicken bbq recipes, and found this but now I need a lamb recipe, do you think this would work well for lamb too? (It sound like it would for me) is that lamb a common meat in georgia? I live in Sweden where pork is the most common meat but in my family no one eats pork, its just a family tradition, since we have always been sheep farmers (which is very rare in sweden) we have our own customs so we don’t ever eat pork (it even feels weird to me to eat pork, feels the same as eating badger or a dog, I don’t have any good reason I’m not a jew or muslim but I just am not brought up with it) but we got a lot of lamb. Would this recipy be traditional for lamb barbecue too in Georgia? I don’t know much about Georgia, except the very good tea that comes from there, since I’m a tea nerd. I got a big bag of tea from Nagobilev village, which is one of the best non-Chinese and non-Darjeeling/Sikkim black teas in the world. Hi Johan, I am pleased that you found us. Yes, the recipe will work with lamb. Pork and chicken are the favorite meats for barbecue here in Georgia. Lamb is popular in stews. Try the recipe and let us know what you think. 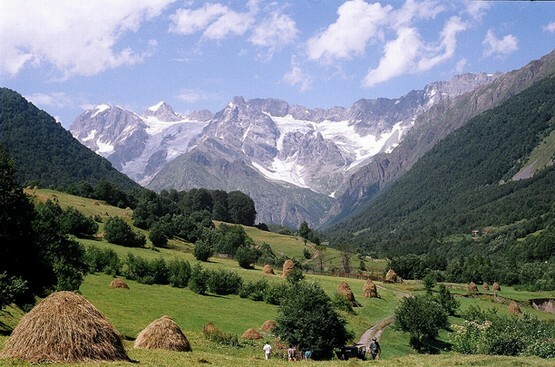 We have published recipes for a number of traditional Georgian dishes on this blog. Please have a look – they are delicious! If you like what you see on the blog please Click on the Follow Blog by Email button and you will receive notifications of new posts.